Corporate parties, dinners, and product launchings are some of the major and minor events that need invitations. These invitations can work two ways, as a piece of paper that can make an event exclusive, and as memorabilia. So what makes an invitation card effective and worth keeping? This article will teach you just that. 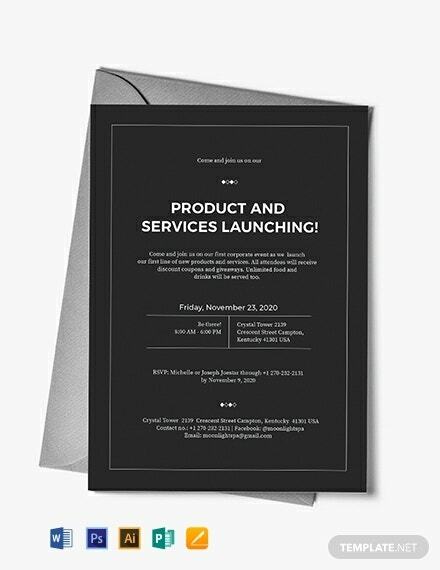 Here are five steps to creating a corporate invitation sample. Determining the number of guests is very important in making an invitation card. Overproduction will be a waste of money while producing less than what is needed is a bad impression on the guests. Make sure to include an RSVP on your invitation card so that you will have an estimate of the total number of guests that are actually coming. If you want to use graphics for your invitation card, make sure that the photos you will be taking are royalty free or stock photos. As for photos, make sure they are in high resolution and it should stay that way even when scaled down to another size. Make the quality of your designs top priority to be able to fully impress the guests. Basic key information includes the name of the event, the event’s hosts and sponsors, time and date, venue, and the name of the invited guest. Make sure to set the time and date on stone as these guests have probably set aside another activity for your event. Another reason is that starting a program too early or too late is very unprofessional. Personalize your invitation card by putting in personal pictures if applicable. You can also add branding elements such as the company logo. Edit your template by starting with the font specifications, make sure that the texts are legible. As for the design, don’t overcrowd your template with vectors and use complementary colors. Break through the commodity invitation card types, feel free to try out other printing methods and printing mediums for a unique and more memorable invitation card. Save an electronic file of your corporate invitation template in case there are circumstances when you have to email your invitation. 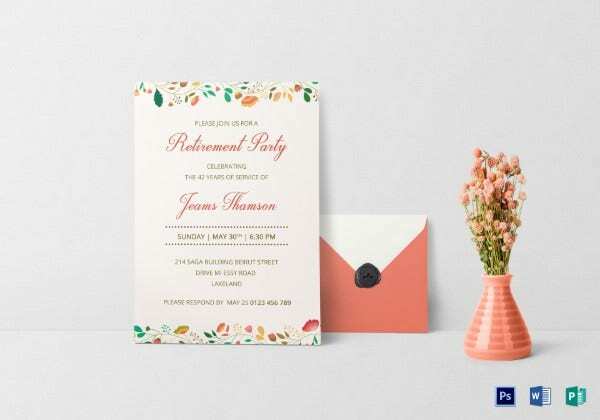 Invite your co-workers using unique and memorable party invitation templates. 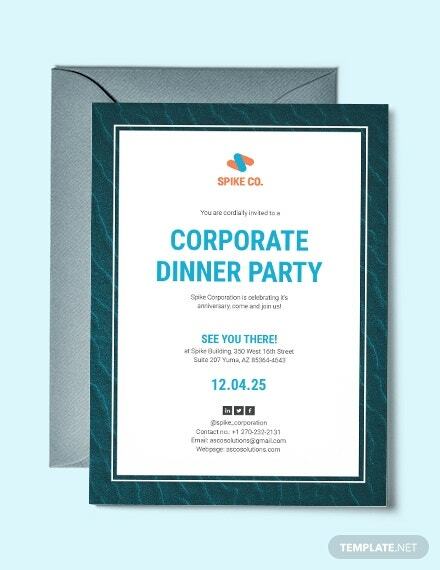 Don’t let this Corporate Dinner Party Invitation Template pass you by today. You can freely customize its entire layout, change the colors, add contents and photos, and more. It can be edited using various modern editing applications. Make your corporate party more special with this Denim Corporate Invitation Template. This template is designed with cool illustrations in a style that you and your guests will love. Freely customize this template to fit your preferences with the use of modern devices, anywhere, anytime. It is granted that invitations ought to be attractive and exciting to increase the chances of a guest to coming to your event. 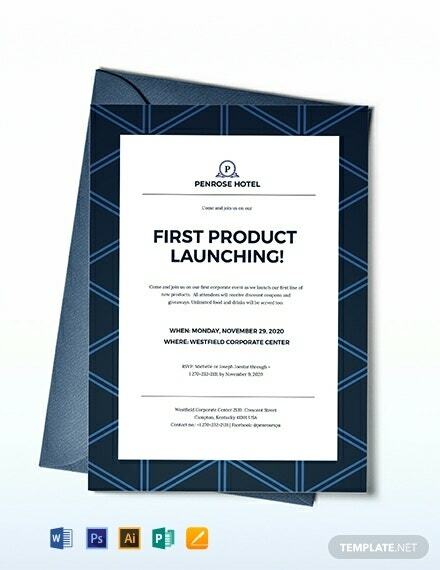 Here is our premium Product Launching Corporate Event Invitation Template. Perfect for professional use, these invitations are pre-designed for your convenience. 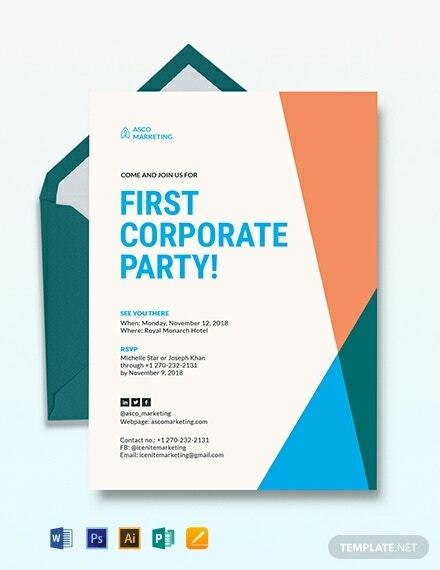 Apart from this Geometric Corporate Party Invitation Template being hassle-free when it comes to editing, this template is also available in different formats, with its compatibility with different editing applications. Retirement is a remarkable moment in a person’s life, make this celebration more special with this Corporate Retirement Party Invitation Template. The best feature this template can offer you is that it is fully customizable and very easy to edit. Grab this great deal today! 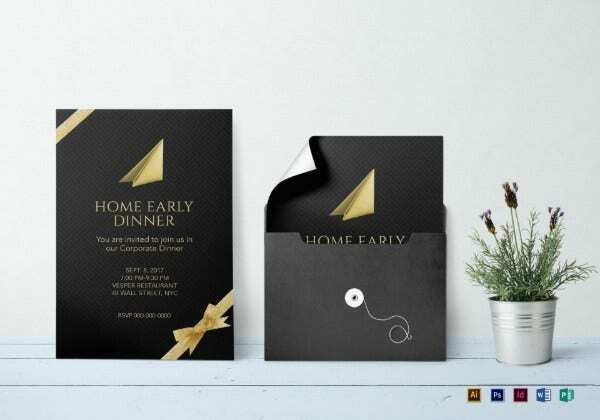 This Elegant Corporate Dinner Invitation Template is made by a team of talented professionals. This team has made this template user-friendly with its royalty free graphics on scalable vectors so that they can be easily adjusted to your preferences. Get this high quality template now. Planning to invite everyone out in the company for a picnic? 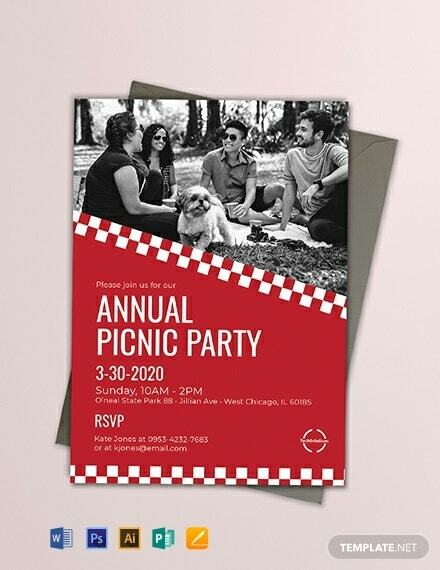 Let this Free Corporate Picnic Invitation Template help you out! We provide royalty-free images, designs, and graphics. This template is printable anytime and anywhere on any modern device, making editing more convenient as well. 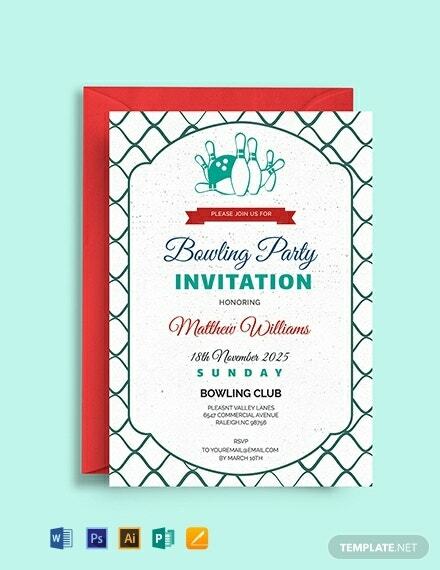 Invite everyone to a fun game of bowling using this Free Corporate Bowling Invitation Template. Turn up everyone’s competitive side with this well-made template. With this template, feel free to add more texts, change the layout, or add photos with it. Download this template for free! 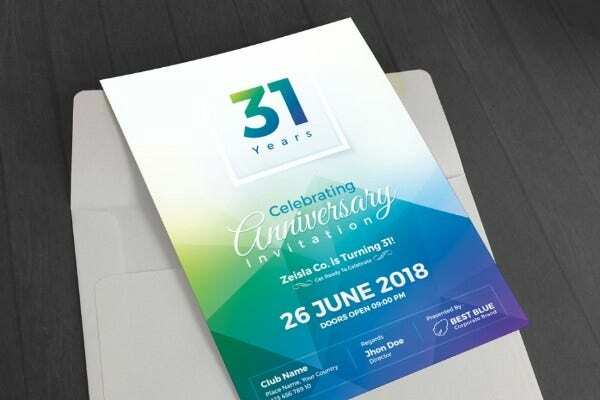 Celebrate your company’s biggest milestone by handing out invitations made with this Anniversary Corporate Invitation Template. Aside from this template looking minimalistic, it is a high-quality template made with royalty free graphics and scalable vectors for easy editing. 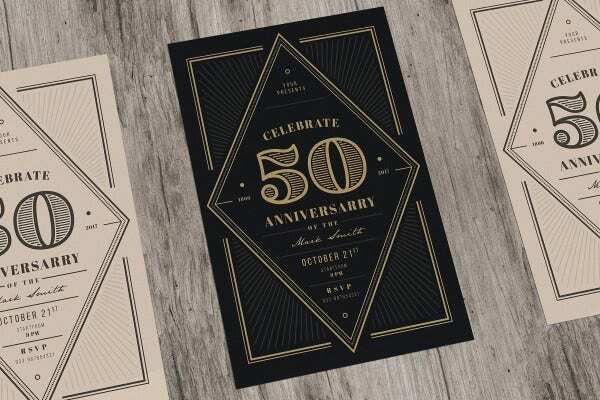 Celebrate your company’s most important milestone with the help of this Vintage Anniversary Corporate Invitation Template. Make everything about the celebration memorable by using this high quality template which looks like a blast from the past. This template is editable and customizable. Do you want a unique template that is sure to impress the guests? 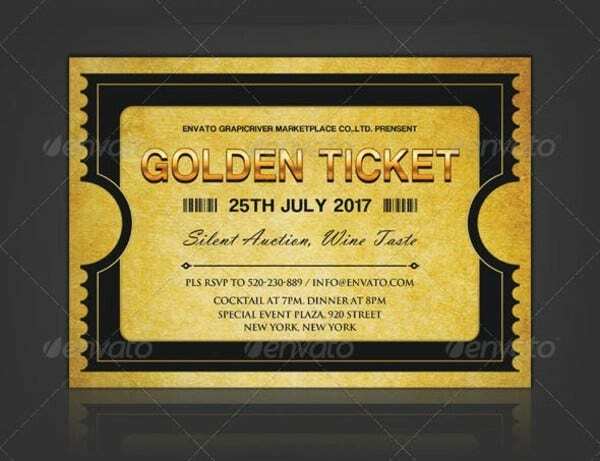 Then this Golden Silver Ticket Corporate Invitation Template is just what you need. This is a high-quality template which is fully customizable, easy to download, and easy to print at home, in the office, or even at a shop. Download this now!